You know what I like about being lazy? I can wait for the other bloggers in the heavenly cake bakers group to post their thoughts on something before I even decide to bake it. Plus, I can get ideas on what to tweak so that I’ll like the outcome better. 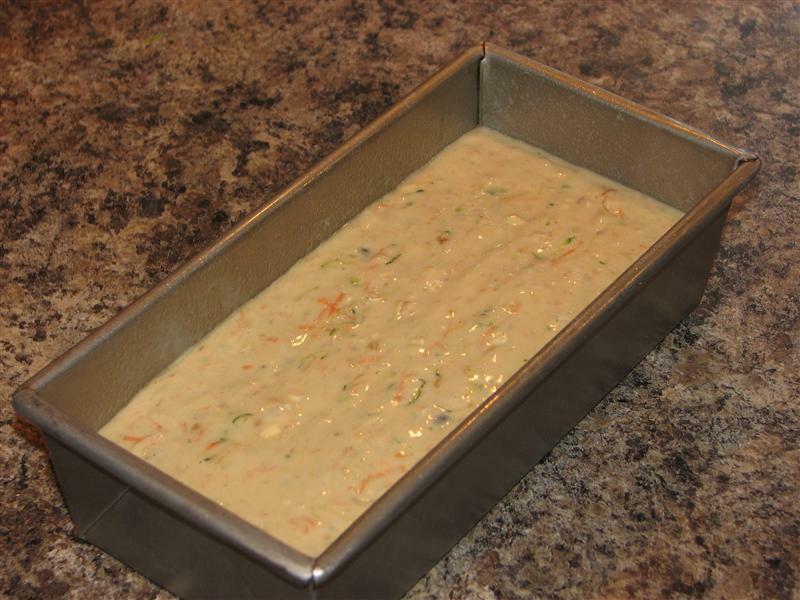 This week’s selection is the “Many Splendored” quick bread. I’m not sure what “splendored” is supposed to mean, and since Firefox’s spell check doesn’t recognize it, I suspect I’m not the only one. 😉 This is a ‘cake’ with zucchini, carrots, oatmeal and bananas. Maybe those are the splendours referred to in the title? I read a few of the other bakers’ posts, and decided that since this isn’t as sweet as some might have liked, I’d swap the walnuts out in favour of chocolate chips. You can’t go wrong with chocolate chips with banananana. I took issue with one of the instructions in the recipe. Rose asks you to whisk together the dry ingredients, then sift them into another bowl. Is there really a significant difference between that and sifting straight into a bowl, then whisking? You need to stir the oatmeal in after sifting anyway. Why dirty another bowl? You start by mixing the sugars with the oil, egg, and banananananana (*ahem* sorry). Then add the water, gradually. I’m guessing the goal here is to keep some sort of emulsion going on, and not have the oil separate from the water. 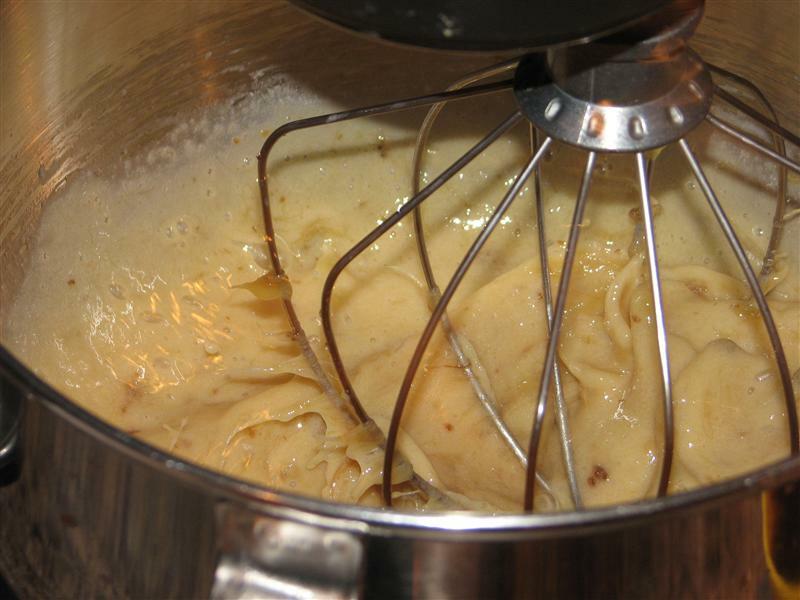 Then add the vanilla, followed by the dry ingredients. Throw the walnuts (or chocolate chips, in my case) in at the end, then spread in your loaf pan. The instructions say to use a knife to cut a seam down the centre for an attractive split, after 15 minutes of baking, so I did that. It was ready to come out about 40 minutes later. And, that’s it. This was pretty good. The banana overwhelms the carrot and zucchini, which isn’t a bad thing, in my opinion. It’s basically a really moist banana bread. I’ve always loved the combination of chocolate and banana, so I the addition of chocolate chips worked well, though I think I would probably double them if/when I make it again. I substituted them gram for gram for the walnuts, and I think this could use just a bit more of a chocolate punch. By the way, I did make the chocolate soufflé/lava cakes last weekend, but neglected to blog about it. We finished up the kitchen reno on Saturday, then spent the weekend in it, cooking, baking, and prepping. Monday, we hosted my grandparents, 2 sets of aunts and uncles, and a couple of cousins for Thanksgiving dinner. It was a fantastic way to celebrate the end of the reno. Then Tuesday morning, Jay received a job offer. He formally accepted Wednesday after a bit of back and forth. Friday, I found out my grandfather’s in the hospital again with fluid in his lungs. I picked up some lunch to share with Grandma yesterday, and picked her up to take her to my cousin’s baby’s baby shower, then drove her to the hospital to visit Grandpa, and drove her home again afterwards. I’m glad I’m living close enough to them now that I can do things like that, but some days I wish I lived less than 1.5 hrs away. Today, Jay started at his new job! He’s going to keep his existing hosting customers, but we’re both really looking forward to having a second predictable pay cheque. …and with that, I think it’s bed time. 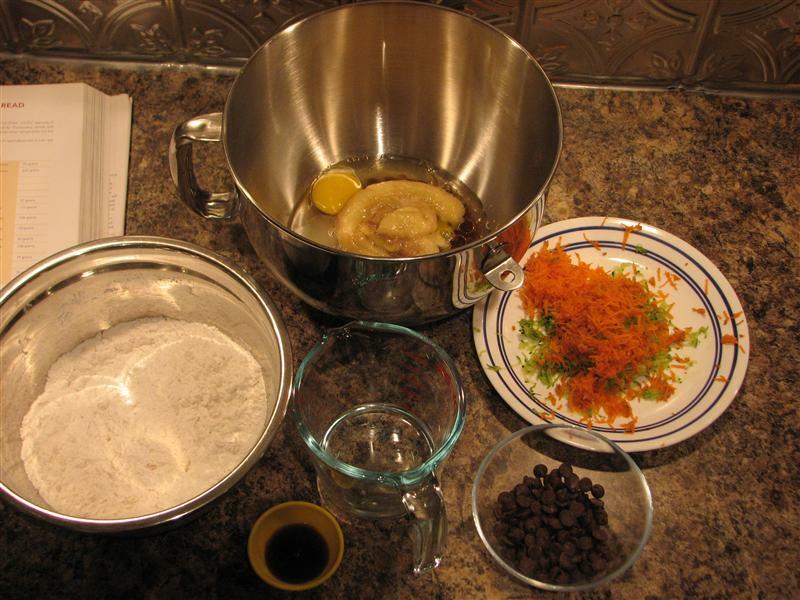 Posted on October 18, 2010 by KristinaPosted in BakingTagged banana, carrot, heavenly cakes, quick bread. Hope Grandpa is doing better. What a busy and also exciting time for you. Congrats on the new job for Jay. The chocolate chips were a great idea. Wish I’d thought of that! your loaf looks so pretty and professional with its shiny crust and proper split! i was too lazy to bother with slashing the bread. i forgot about those zany instructions to sift into another bowl…i think i ignored it too! sounds like life has been really busy. i hope your grandpa is doing ok. Your bread looks great. Congrat’s on your kitchen and on the new job. Oh my… I’m exhausted just reading about your hectic schedule. Congrats to your hubby, and I hope your grandfather gets better real soon. As for your loaf – love the chocolate substitution, and thanks for suggesting even more chocolate. What’s not to love?